Wondering when Folly Beach County Park will reopen to the public? Youre not alone. The popular beach park has been closed since Hurricane Irene in 2011. Continuing erosion has kept the park close since. But heres the good news: crews are currently working on the Folly Beach County Park Shore Stabilization Project, which will add sand back to park and open it to beach goers looking for sunshine on the western end of the island. On the web site for the Charleston County Park and Recreation Commission (CCPRC) has begun posting regular updates about the construction and renourishment project. Over 70,000 cubic yards of sand has been pumped since 4 p.m. on Sunday, read the May 9 update. The May 15 update reads Contractors involved with the construction of the terminal groin drove the first of several hundred steel sheet piles into the sand this morning. Photos show heavy machinery and work crews in orange vests driving pilings into the Folly Shore. 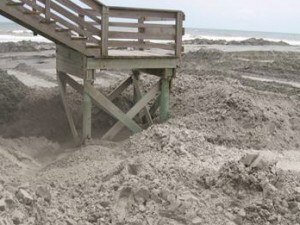 The terminal groin will help preserve the sand on Folly, and give birds and sea turtles a place to land and nest. While a firm reopening date hasnt been announced, CCPRC hopes to allow the public back on the beach by July. Of course, this date will be influenced by weather and a number of other factors.